Most gas leaf blowers use a mixture of gas and two-cycle oil. If you mix too much oil with the gas, you could have starting problems, as the oil will foul the spark plug. Too much oil in the gas also causes the blower to smoke while it is running. Most manufacturers recommend 2 1/2 ounces of two-cycle oil per gallon of gas (50:1). Some of the newer blowers have four-cycle engines and do not need the two-cycle mixture, but they are started the same way as the two-cycle engines. Leaf blowers aid in home maintenance by allowing the home owner to blow cut grass or leaves into a manageable pile. Mix the gas and oil in a small gas can. Gently shake the can to help incorporate the oil into the gas. Fill the leaf blower's gas tank with the gas and oil mixture. 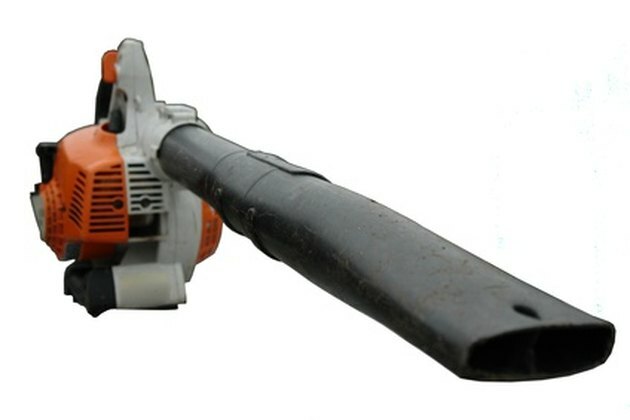 If your leaf blower has a four-cycle engine, use straight gas. Push the primer bulb in and release it slowly six times. Close the choke (put the choke on). Pull the starting cord one time. Partially open the choke by moving the lever to the halfway point between open and close. Pull the starting cord one to four times. Allow the engine to run for at least 10 seconds. Move the choke lever into the open position. Some models might need up to 30 seconds of running with a partially closed choke. If the engine stalls, pull the starting cord to restart the engine. Allow the engine to warm up for 20 seconds before moving the choke to the open position.